This is the last sundress I've made for M. I do hope to make C. some shirred summer tops, but she's picky and in Honduras, sailing, so I'll wait to start until she gets home. 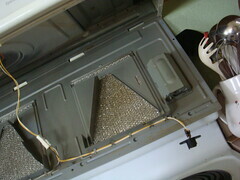 In other news, we've had a broken light bulb in our microwave/hood for years. When we tried to change it the bulb broke and wouldn't come out. Over time I've tried using a potato to get it out, a pliers, tongs, whatever. Nothing has worked. Of course this is in the hood area so it's impossible to see without laying on the stove ... risking glass and metal falling and landing in your eye. So today I unscrewed the whole thing and, after much finagling, twisting, and turning I got the broken bulb out! Now I'm off to get a new bulb and see if it will actually work ... and then try to put the whole thing back together again. If this actually works I'm going to be so proud of myself. I've screwed up a few other home repair projects over the last few months, so to have one go well will be extremely rewarding. Hola mi nombre es Fabiana soy de Costa Rica me gusta muchísimo el Quilting.. Me ha gustado tu blog, tienes trabajos muy bellos. 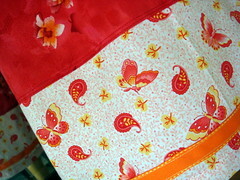 Hello my name is Fabiana'm from Costa Rica I like very much .. Quilting I liked your blog, you have very beautiful work. lovely dress!! so, did it work? i sure hope so. feels so good to accomplish something like this.